Photo courtesy Team Vesco Racing. Camille Jenatzy might have set his own wheel-driven land-speed record nearly 120 years ago, but judging from the name he gave his steed — La Jamais Contente, “never satisfied” — even then he knew how the siren call of greater speed would keep racers from resting on their laurels, just as it drew Team Vesco and their Turbinator to Bonneville this month in an attempt to re-set their own wheel-driven land-speed record north of the 500-mph mark. The start of the rainy season at Bonneville, however, kept them satisfied for now. “We are evaluating our options,” Rick Vesco said after the Southern California Timing Association called an early end to this year’s World Finals due to a rainstorm that swept over and flooded the Bonneville Salt Flats. Earlier in the event, the Turbinator — which already set the record for wheel-driven vehicles during September’s World of Speed event at 482.646 mph — made a pass that measured 493 mph in the fifth mile and that hit an exit speed of 503 mph. While no wheel-driven vehicle has ever made a pass in excess of 500 mph, Vesco said that the Turbinator needed a backup pass that measured more than 510 mph to officially set a 500-plus record. The Turbinator sat in impound awaiting that backup pass when the rains came. “The last thing we wanted to do was leave vehicles in impound,” the SCTA wrote on its Facebook page announcing the cancellation. According to the SCTA’s Bill Lattin, “the times will stand as is” without record runs. Longtime Bonneville racer Don Vesco envisioned the original Turbinator streamliner as a means of capturing the wheel-driven land-speed record, using a 4,400-horsepower shaft-output internal-combustion turbine engine. On its debut in 2001, Don Vesco accomplished his goal by setting a record of 458.440 mph; however, he hit an exit speed of 470 mph on one of his runs, leading him to believe that 500 mph was in reach, according to the Team Vesco website. While Don Vesco died of cancer in 2002, his brother Rick vowed to press on toward that goal, and in 2013 revived the Turbinator, this time with a Lycoming T3 turbine engine developing 5,000 horsepower and driving all four wheels through a custom 2:1 reduction gear unit. Rather than pilot it himself, he enlisted Dave Spangler to drive the rechristened Turbinator II. Just as Don Vesco’s 470-mph exit speed spurred him to reach for 500 mph, the 492-mph pass that Spangler made on the way to that September record prodded Team Vesco to return to the salt last week. According to an article in Autoweek, Rick Vesco planned to get to 500 mph by adding 400 horsepower via increasing the fuel and rpms and by tweaking the GPS-controlled software tied into the traction control and electric fuel-control systems. Team Vesco will have to wait until next August’s Speedweek for the next SCTA event at Bonneville. 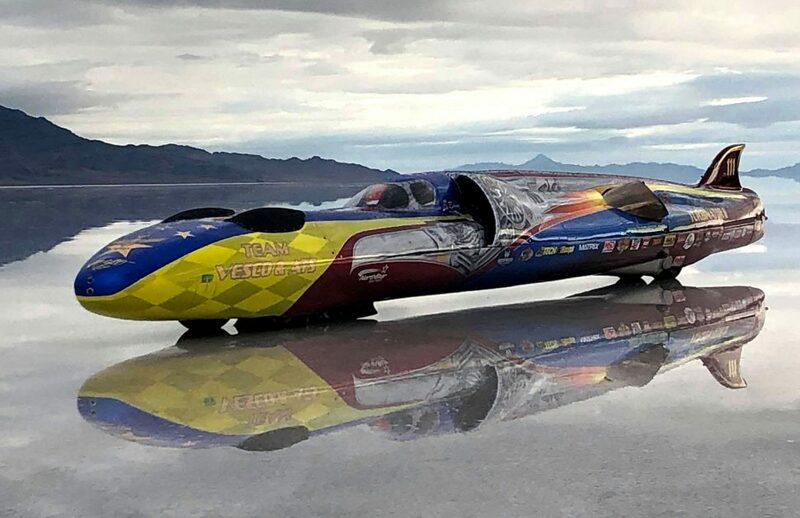 Rick Vesco said his team is currently exploring options for obtaining an FIA-certified record, though he said he would need “a longer stretch of track than is currently available,” citing the ongoing salt mining at Bonneville. Of the alternatives to Bonneville that ultimate land-speed-record teams have explored, three are located in North America: Black Rock Desert in northwestern Nevada, the Alvord Desert in Oregon, and Diamond Valley in central Nevada.